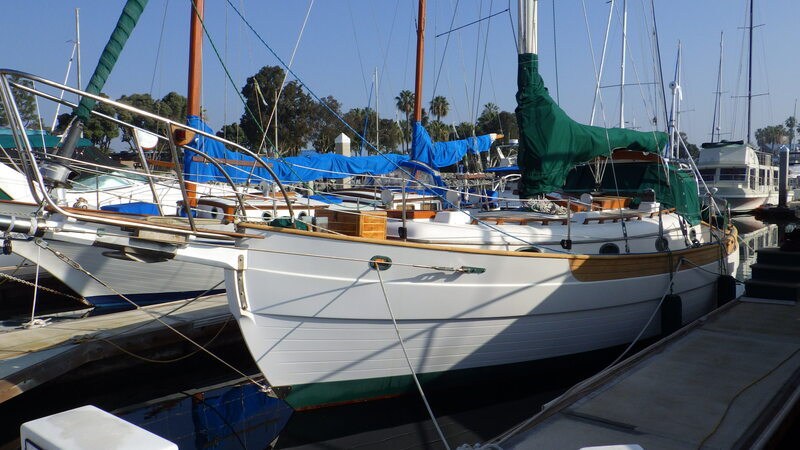 40' Hans Christian sailboat | Christian & Co. The vessel was inspected while afloat. Hull construction material is molded fiberglass. Deck is constructed of teak planks over molded fiberglass and above deck structures are constructed of molded fiberglass. Coring is unknown. Bulkheads are constructed of plywood. Overall condition of the hull structure appears good. The vessel’s weight is unknown. Exterior rails and hardware appear good. Mast, mast step, standing rigging and chain plates, where visible, appear satisfactory, age of standing rigging is unknown. Cosmetic condition of vessel appears satisfactory – good externally and good internally. Vessel’s external colors are white. Below waterline through hull fittings appear satisfactory. The vessel is equipped with one manual and one electric / automatic bilge pump that appear satisfactory and the bilge is holding minimal water. The ventilation system consists of natural ventilation and appears satisfactory. General housekeeping appears good. and rudder port appears satisfactory. Propulsion components were not examined. are located on tank and appears satisfactory. outlets appear satisfactory – good. The AC main feed is protected with a circuit breaker. 10/2018 battery, smoke & C0 alarm. The vessel is a composite fiberglass cruising sailboat equipped with a diesel engine. standing rigging, it was inspected and some components were replaced four years ago. vessel is basically structurally and mechanically sound. The vessel is well maintained. potentially as a blue water vessel. or replaced every six years. 3. Display the documentations number per federal regulations. for teak decks for this age. Address as necessary. the cracks or monitor carefully and address as necessary.